Brother Rowe went on to serve in WWII and attain the rank of Brigadier General. On this date, World War I Veteran and NY Alpha Brother Lieutenant Henry Q. Griffin, U.S. Army / American Expeditionary Forces (A.E.F.) made the ultimate sacrifice during while engaging the enemy near St. Agnan, France. Brother Griffin was posthumously awarded the Distinguished Service Cross for his action on this date. World War I Veteran and First Secretary of IL Alpha First Lieutenant Louis Irving Phillis, U.S. Army Aviation Corps was killed on this date in Tours, France. Information obtained by SPP states Brother Phillis was killed in an accident versus in combat as previously reported. ﻿Brother Phillis was reportedly the first secretary of IL Alpha and the first chapter brother to cross the Atlantic to “fight the Kaiser.” Unfortunately, he was also the first IL Alpha man to be killed in World War I. At the time of his death, Brother Phillis was serving in the same unit – the 95th Aero Squadron – as Quentin Roosevelt, the son of Former President Theodore Roosevelt. Respect can be paid to Brother Phillis at Union Cemetery, Morrisonville, New York. MT Alpha Brother Albert Schak was awarded the French Croise de Guerre for his action on this date during the final stages of the Battle of the Marne, and was subsequently with the first unit to cross the Rhine River. On this date, Mexican Campaign & World War I Veteran, VA Theta Brother (then) Major General Leonard Townsend Gerow, U.S. Army became commander of V Corps – at the time the largest unit of troops in the European Theater of Operations. Brother Gerow played a major role in the planning of the invasion of continental Europe. He would be the first corps commander ashore on D-Day, June 6, 1944, and the first American officer of the rank of major general to enter Paris after its liberation. Following graduation, AL Beta Brother James Calabra, Jr. entered the U.S. Army on this date. This is the date of rank of General in the U.S. Army for Mexican Campaign, World War I & World War II Veteran, VA Theta Brother Leonard Townsend Gerow. World War I Veteran and NH Alpha Renaissance Brother Major Wayne Edson Stevens, U.S. Army died on this date. World War I Veteran, U.S. Congressman (Iowa), Iowa State Representative and PA Xi Brother First Lieutenant Paul Harvey Cunningham, U.S. Army / American Expeditionary Force died on this date in Brainerd, Minnesota. During the First World War, Brother Cunningham served as an infantry officer, 1917-1919. After the war he moved to Des Moines, IA, and the next year joined the Iowa National Guard where he served until 1923. Born on a farm in Indiana County, Pennsylvania in 1890, Paul attended public schools, and graduated from State Teachers College in Indiana, PA (now Indiana University of Pennsylvania). Brother Cunningham continued his education at the University of Michigan, and after receiving his law degree was admitted to the bar in 1915. Respect can be paid to Brother Cunningham at Masonic Cemetery, Des Moines, Iowa. On this date, Vietnam Veteran and PA Eta Brother Second Lieutenant Gene “Smedley” McMullen, U.S. Marine Corps Reserve made the ultimate sacrifice when he was killed in action in Quang Tri Province, South Vietnam by Viet Cong counter battery fire. ﻿Gene was born in 1942 in West Chester, Pennsylvania, the same year his father enlisted in the Marine Corps. At Penn State, Brother McMullen played on the varsity football team, was a member of Phi Beta Kappa, and enrolled in the NROTC and their PLC (Platoon Leaders Course) as he prepared to enter the Marine Corps. Like so many other SigEp Marine Patriots before and after, he trained at Quantico, Virginia his freshman, sophomore and junior years. 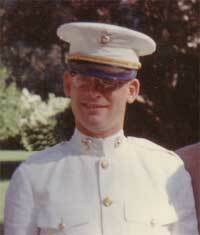 During the summer of 1965, Brother McMullen entered Basic School at Quantico. While there he was a member of the 1965 Quantico football team. After graduation he chose Artillery and was sent to Fort Sill, OK and then on to Camp Pendleton. In May 1966, he was sent to Vietnam where he was assigned to the 12th Marine Regiment as a Forward Observer. He is remembered on Panel 09E, Line 29 of the Vietnam Veterans Memorial Wall. Brother McMullen was buried with full military honors in Section 3, Site 2560-B in Arlington National Cemetery, Arlington, VA.
VA Alpha Brother Specialist 4 Hunter Floyd Spencer, Jr., U.S. Army Reserve died on this date. He served in the Adjutant General Corps. Respect can be paid to Brother Spencer at Section Q, Lot 2 at Greenlawn Memorial Park, Newport News, VA.
U.S Navy World War II Veteran, Governor (Colorado) and CO Beta Brother John Arthur Love resigned the Colorado governorship on this date after 10 years of service to become the nation's first director of the Office of Energy Policy for president Richard M. Nixon. PA Eta Brother Lieutenant Colonel Daniel A. Augustyniak, U.S. Air Force, 63, died on this date after a long battle with brain cancer. Commissioned in the U.S. Air Force upon his graduation from Penn State University (PSU), he served 18 years and six months and retired as a Lieutenant Colonel. His next career involved five years of civil service work at the Air Force Logistics Command at Kelly Air Force Base. Born in 1941, Brother Augustyniak attended PSU and earned a Bachelor's Degree in History and also received a Master's Degree in Political Science from St. Mary's University. His most recent “career” involved ten years of dedicated work to the Men's Ministry at St. Luke's Catholic Church. This was his most fulfilling endeavor, with his brothers staying with him through his illness. Buried with full military honors, respect can be paid to Brother Augustyniak at Fort Sam Houston National Cemetery, San Antonio, TX. World War II Veteran NY Beta Brother Joseph I. Whittlesey, 87, died on this date in Cohoes, NY. During WWII, Brother Whittlesey served in France and Germany, where he earned several medals. After the war, he graduated from Cornell in 1949 with a degree in electrical engineering, and worked as an engineer for General Electric for 38 years before retiring in 1984. Joseph was born in 1922 in Pittsfield, MA. He was active in the community, having worked with the Animal Protection Foundation, Boy Scout Troop 36, the Woodhaven Homeowners Association, the Annie Schaffer Senior Center and Vale Cemetery. In addition Joseph was a longtime Republican committeeman and 32nd Degree Mason. Brother Whittlesey was also a 32nd Degree Mason. – Mayor of Dothan, AL Beta Brother Captain Alfred Joseph Saliba, U.S. Air Force Reserve passed away at home in the city of his birth, Dothan, Alabama. Alfred spent two years on active duty in the U.S. Air Force, stationed in Japan and Korea, and rose to the rank of Captain in the U.S. Air Force Reserve. Born in 1930, except for his military service, he lived most of his life in Dothan, attending public schools, working as a teen in a local shoe store, and returning as a young adult to establish a business and nurture a family in the city he loved. Alfred was a proud graduate of the University of Alabama's School of Engineering. After working with his father at Dothan Roofing and Remodeling, he built a successful business bearing his name which included homebuilding, residential and commercial real estate, neighborhood development, and commercial construction. Brother Saliba wisely partnered and invested in other local businesses and real estate ventures, and in 1999 and 2011, he was inducted in the Business Halls of Fame for the University of Alabama and the Dothan Area Chamber of Commerce, respectively. Beginning with Dothan High School's Class of 1948, Alfred, an Eagle Scout, served as president, chairman, or trustee of almost every group or organization he belonged to. He led the engineering school, AL Beta, Dothan JayCees, Chamber of Commerce, Wiregrass United Way campaign, and many community boards. In every civic endeavor, he brought to those positions a keen mind, a businessman's expertise, and a heart for the community, demonstrated in service with The Salvation Army, Habitat for Humanity, Hawk-Houston Boys Club, and Evergreen Presbyterian Church, where he served as an elder. Motivated by a desire to "give back" to the city he loved so much, from 1989 through 1997, Saliba served two terms as the city's mayor. Commitment to improving the city's infrastructure, recruiting new business, and providing opportunities for underserved families became the hallmarks of his tenure. Working with other visionaries, he helped establish a Family Services Center, which centralized education, childcare, and access to resource agencies. It became the prototype for 17 similar organizations throughout the Southeast and now bears his name. Memorial contributions to the Alfred Saliba Family Services Center or Evergreen Presbyterian Church would celebrate Alfred's lifelong compassion and generosity. – Operation ENDURING FREEDOM Veteran and CT Alpha Brother Sergeant Kenneth Saavedra, Jr., U.S. Army & National Guard (Connecticut), 29, died in Waterbury, Connecticut. He was a Sergeant with the U.S. Army 1 Battalion, 102nd Infantry Regiment and served two tours of duty in Afghanistan. He continued to serve with the National Guard for almost 10 years. Kenneth was an electrician and worked for Sikorsky Aircraft. He was a member of the Teamsters Local 1150, and was Vice Chair of the Teamsters Veterans Caucus Connecticut Chapter 1. Kenneth also supported the Wounded Heroes Fund. At the request of the family, memorial contributions can be made to the Kenneth Saavedra Jr. Memorial Fund to benefit Veterans through the funeral home. Laid to rest with full military honors, respect can be paid to Brother Saavedra at the Connecticut Veterans’ Cemetery, Rocky Hill, CT.
U.S. Navy World War II Veteran and KS Gamma Brother Ralph Clark Ufford died on this date. After his military service, Brother Ufford graduated from the University of Kansas, Class of 1949. * Operation ENDURING FREEDOM Veteran and PA Xi Brother Major Kevin Michael, U.S. Air Force has been selected for promotion to Lieutenant Colonel. Congratulations Brother!